An award winning journalist reveals how she discovered major stories and relentlessly pursued them on the northern California coast. From working on boats with commercial fishermen, to going to war with the US Navy she vividly describes what lay behind the exciting stories she covered. 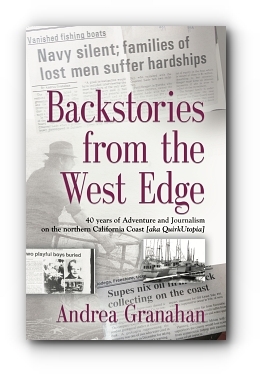 Andrea Granahan has served as a journalist on California’s north coast for four decades. She describes the rural area she worked in as "QuirkUtopia" because of the varied and interesting people (and animals) she has met there. She revisits the roots of some of the more controversial and exciting events she covered as a reporter. From going to war with the US Navy over submarines killing fishermen, to Mario Savio demanding she censor her journalism students, Granahan’s career saw a lot of action. Some of her tales will make you laugh, others bring you to tears, or stir your sense of justice. This book reveals a unique corner of the world and shows small town journalism at work proving the pen is still mighty. Hilarious, touching account of an American family in rural Greece. Poetry that avoids obscurity and offers plain, simple communication. Andrea Granahan has won awards for her reporting and feature writing from the California Newspaper Publishers Assn. and the National Newspaper Publishers Assn. She is the only reporter to hold three Lincoln Steffens awards for investigative reporting. She was the founding publisher of the Bodega Bay Navigator, a weekly newspaper. Her work covering the fishing industry has been described as unparalleled. She currently works as a travel journalist.